Where We’ll Be and What You’ll See » Embroidery Talk Has Moved! Obviously, we hope that all of you attending each of these shows will stop by and see us. If you stop and see us at a DAX or NNEP show, you’ll find a booth full of product at show special prices. Our booth design this year gives us even more display space and we’re going to fill it with great EnMart products. We’ll have sublimation supplies, printers, thread, backing, accessories, and other goodies on display and for sale in the booth. If you want to save on shipping and save a little bit off the regular cost of the product as well, bring your wallet and come visit us at the DAX or NNEP shows. It will definitely be worth your time. EnMart will also be offering demonstrations in our booth. Nancy Rasmussen of Encore Embroidery Equipment Sales will be co-exhibiting with us, showcasing the Melco Bravo embroidery machine, and running Iris Thread from EnMart. We’ll also have sublimation printers and a heat press running. This year we have a combo press in the booth, so we can potentially do mugs as well as flat goods. If you have questions about sublimation or embroidery, stop by and see us. We have knowledgeable experts staffing the booth and they’ll be happy to answer questions and help you find the right supplies and equipment for you. We look forward to seeing you all at the shows in March. If you have any questions about a particular show, or need information about registering, please feel free to contact us. 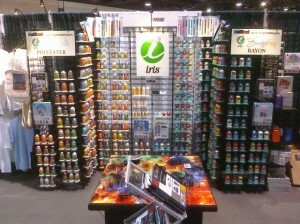 This entry was posted on Tuesday, February 14th, 2012 at 11:09 am and is filed under Trade Shows. You can follow any responses to this entry through the RSS 2.0 feed. Both comments and pings are currently closed. I’ve booked a couple of speakers to be present at trade show booths for clients, and you’re absolutely right lead follow up is incredibly important, especially internally to maximize the value. Thanks for the great post Mike!